Caleb's fleece is remarkable. In 2013 his fleece tested at 20.4 microns, SD 3.7, CV 18.2 with 1.1% greater than 30. The 2017 shearing results have the same "feel." Check out his Certificate for the bloodlines to discover the reasons for these results. He is a beautiful male with perfect confirmation and a pleasant personality. His color is very light beige ... nearly white! 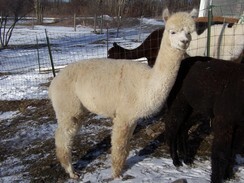 Caleb is not proven as we had to halt our breeding program due to herd size. However he is not gelded and is ready! !